Where do you go for petroleum geology information in West Texas? One of the fine Texas Geological Societies; of course! Datapages has completed our inhouse data mining operation to bring you more West Texas data. Our goal was to deliver Datapages Exploration Objects (DEO) subscribers the most complete set of actionable intel, AAPG can provide. 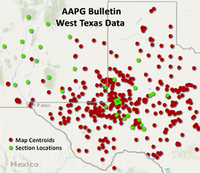 We dusted off our 100-year-old AAPG Bulletin articles and added more than 750 maps and 350 section/well logs/seismic locations to DEO. Every object is georeferenced and ready to use.